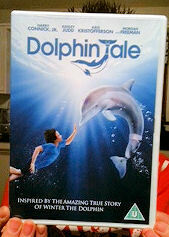 We were sent Dolphin Tale from Warner Brothers to review. I am not quite sure where to start with this film. It’s based on the Real Life story of Winter the dolphin. Sad, funny, poignant and a lesson on overcoming disability when she has to learn to live without her tail. I had half an eye and half an ear to the TV when it began, but from the moment the lovely dolphin caught up in ropes appeared on screen, I was hooked into following the rest of the story to see how it unfolded. This very young dolphin was only 2 months old when she became tangled up in the ropes and cage of a trap. There was one heartstoppingly scary moment where my hands were cupped over my mouth at the helicopter, but you will have to watch it to see what happens. Harry Connick Jnr is easy on the eye for any mum over a certain age so it was easy watching, and Morgan Freeman is brilliant in anything that he is involved in. I don’t want to go into too much detail about what happens in the film as it would spoil it for you if you decide to watch it. Funny moment, sad moments, and plenty for kids to identify with. It is a winner and we highly recommend watching it. Winter stars as herself in the film and she is a pretty good actress for a dolphin. I spotted the film for sale at Amazon for a good price, and when the film is finished, children can go online to watch Winter in her real life tank. There are 4 webcams in total and a history of Winter’s life from the moment she was found. I had a thoroughly enjoyable hour working through the website and reading the actual story of how her life has moved along. We loved it, thought it was verysesitive look at disability. I actually thought it was a good gentle explanation for kids of not writing off disabilities and that life can go on as normal, and those with disabilities are just as loveable. Not using a human makes it less in your face but I think its there all the same. See you tomorrow, can L watch that while we chat?